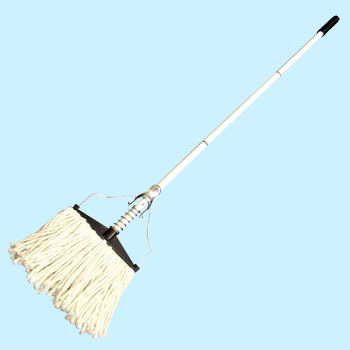 It is good because the quality of mop is good for the price and it is easy to use. This review is about item#7060925. I used it for the floor coating of wax brush. I could use it without any problem. Because the tip mop is slightly thick, it smokes plenty plenty. It is a specification that comes loose for a while as it is a link type. I could not install the mop smoothly when I was using it. Since the connection part is weak and easily breakable, I want the structure to be strong even if it is applied. I used it when waxing on a wooden floor. The price is cheap, light and easy to use. Even with waxing, it is also recommended in splashing water spray. Because the handle is divided into three, it is convenient to throw away when disposing. The thread mop included is a nylon pouch, so it is difficult for dirt on the floor to become entangled with threads. Therefore, the substitute thread is using other manufacturer's things. It is saved when it is a set sale and a replacement part of the mop part. This review is about item#07060925. The wands of the three split are weak and loose instantly. When force is applied to the connecting part, it will bend a little. It is hard to transmit force to the floor. Whether it can be used for a long time, I will look at the situation with the future use. However, I think that we will consider different things next time. . . . It is appreciated because it can be disassembled and stored compactly while not in use. I think that there is a hit, but it was a big loser. The connecting part was a glass. Even if you tighten or tighten it, I think the same as a defective item. If you look closely, the pipes and the resin part of the connection are both Tagara. It seems that the screws of the resin part can be fastened tightly. In order to unite the pipe and the resin part, it is united by pressing with a few punches, but this part moves. It is sweet. Is not Masui 's continuing to sell as a product? If I wanted to return it, it would take a shipping fee. It is weeping. Do not join the pipes, use only the bottom tier (it is impossible crowd?) It is a schedule. It is caution for purchase. I bought it because it was affordable. It is a difficult point to hold down the power because it is likely to break thinly. Very cheap, the yarn of the mop is big, it's very easy to use. The pattern is divided into three, but since it is made of delicate plastic, when using the power to use it seems to break. When I arrived in a small jaco, I thought it was not a mop, but when I assembled it I made a wonderful mop and I admired it. I am satisfied because I absorb strong water well.